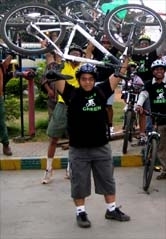 GoGreen 1st Anniversary (20 Sep 2009) - GGI-Group size: 4000+ Professionals, Increasing on day to day basis, Come & join us 2 serve Mother Nature. 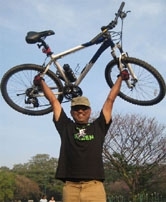 We started off by 7:00am and followed our usual route towards cubbon park. 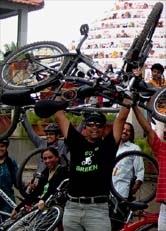 This day we wanted to celebrate our 1st Go Green's Anniversary very grandly. This was the first of its kind where their were 47 participants for various parts of Bangalore and local media TV-9 who were suppose to shoot from the starting point but was not able to due to a small internal miss-communication however they manged to meet us at cubbon park. National media Network 18 was also present to cover our celebrations. Cyclothon registration was also made available on this event and most of them signed to participate in the event that is going to be held on 11 October 2009. Jaynagar 4th Block - Jnagar 3rd block - Ashoka Pillar - Lalbagh West gate - Minerva Circle - Town Hall Hudson Circle - Cubbon Park - City Library - Bangalore Press Club.